Beets are just about the pinkest of pink foods. I mean, that deep, deep pink magenta color is just gorgeous. Anyone who knows me personally knows I’m crazy about PINK! The pinkness of beets is just so vibrant, it makes me happy. Of course you can use any crumbly or grated cheese you like for this, or eliminate it altogether. I like blue cheese because it stands up to the earthiness of the beets. Restaurants often use goat cheese which is also nicely assertive. But you be you. Whatever you like. This is a fairly hearty salad. Serves 2 as a main course or 4 as an appetizer/salad course. Equipment: Large salad bowl, because it’s a large salad 🙂 Or if you’re being fancy, you could plate it on individual plates. Steamer… however you like to steam things. You can get a steamer insert for your favorite lidded pot – there are also inexpensive silicone ones that come in every size (with handles and feet!). Basically you want something that will suspend the beets over the boiling water – not sit them right down in it. You will need a lid for your pot to do the steaming. You also need a medium saute pan for searing these bad boys. These beets are getting the royal treatment. To steam the beets: Put your steaming water to boil. Scrub the little guys well, but no need to peel (in fact, I beg you, don’t peel). Once your water is boiling and your steamer is suspended over it, put the beets in and cover. Check after 25 minutes for small beets (pierce them with a knife, and if they are soft enough, take them out and leave the bigger ones till they’re soft too – my bigger ones took about 35 minutes, but it depends on how big they really are). When they’re done steaming, place in a colander and rinse with cold water – or, if you have the space, fill up a bowl or sink with cold water and plunge your beets into it (dramatically stops the cooking). Now admire the weirdly pink water. OK, remember how I said not to peel them before? Now you can literally SLIP OFF THE SKINS with your fingers. Your fingers will be bright pink. Don’t panic. It will be gone by the time you wash up. Promise. To toast the walnuts: Place the walnuts on a non-stick tray (no oil) and toast them in the toaster oven just like toast, or stick them in the oven at 375 degrees for about 10 minutes. You should smell a toasty-walnut smell. Don’t let it become a burned-walnut smell though. Use your olfactory senses. To sear the beets: I know, you’ve already done things to the beets, but bear with me, this is WORTH IT. Heat 1 T. olive oil in a medium saute pan over medium-high heat, and sear the beats, 10-15 minutes total. Let ’em sit and get brown, then flip ’em over. Can we say CARAMELIZATION? To assemble the salad: Place the baby kale in your large salad bowl, and add as much vinaigrette as you like, to taste (but be light with your touch – you can’t take it out once it’s in!). Now take your clean hands, and massage the vinaigrette right into the salad (for more kale massaging, see here). Seriously, this is the deal maker for nice kale vs. tough kale. 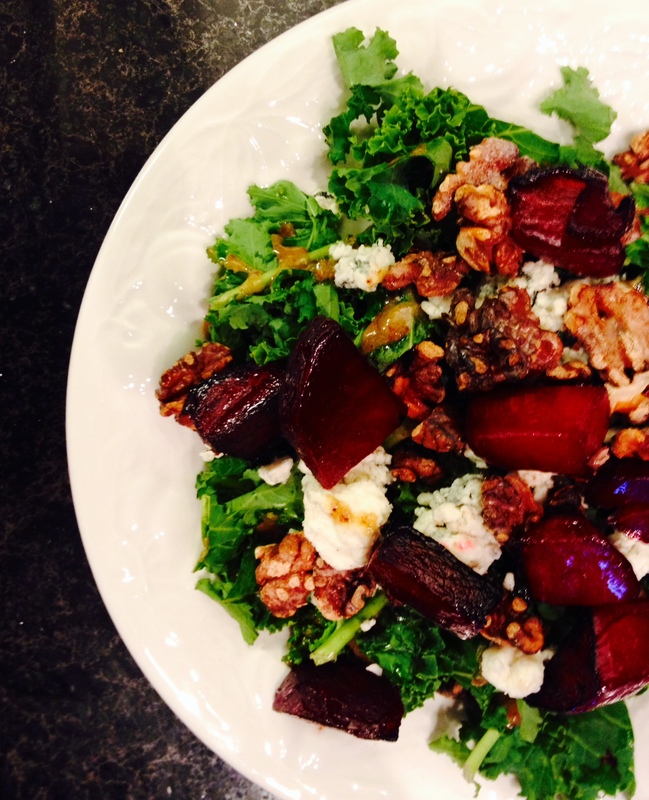 It will get a lot smaller, that’s OK. Top with the seared beets, blue cheese, and toasted walnuts. Add shallots or red onion if using (belatedly, it occurred to me this would work super well). Enjoy! And when you’re in a restaurant and you order this, think to yourself: this is OK but I CAN DO BETTER. Hee.